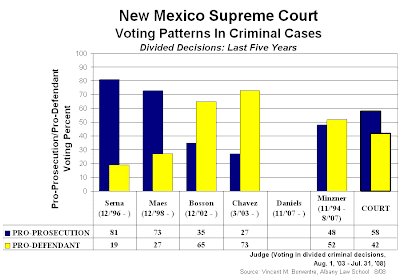 A review of the New Mexico Supreme Court's decisions over the past five years reveals that 41 of them divided the justices. That is, in 41 cases between August 1, 2003 and July 31, 2008, at least one justice disagreed publicly with the majority of the court in a dissenting opinion. That represents approximately 17% of 245 total decisions. (A previous post on the New York Court Watcher discussed this and the contrast with Arizona's high court. See Arizona and New Mexico Supreme Courts: Contrast in the Southwest, August 6, 2008.) Of these 41 nonunanimous decisions, 26 of them involved criminal law, criminal procedure, or some other issue of criminal justice. The decisional and voting breakdown in these 26 divided criminal decisions shows some patterns that are as fascinating [at least to court-watching junkies] as they are clear. Let's begin with the most basic--and perhaps most telling--of patterns: the pro-prosecution versus pro-defendant voting and decision tabulations. GRAPH 1 depicts the pro-prosecution versus pro-defendant voting record of each justice in the 26 divided criminal cases. More specifically, it shows the percentage of these decisions in which each justice took the position more favorable to the prosecution on the issue that divided the court; it likewise shows the percentage of positions taken more favorable to the accused. It also depicts the corresponding pro-prosecution and pro-defendant percentages for the court itself--i.e., the decisions themselves. A look at GRAPH 1 reveals some evident patterns. Two justices of the court have been quite pro-prosecution in their voting over the past five years. Two have been quite pro-defendant. The remaining one has been about 50-50. Overall, then, it would seem that the court's membership has been somewhat evenly balanced ideologically. And not surprisingly, the court's decisional record for the five years has been quite balanced. So, Serna and Maes at one end, Chavez and Bosson at the other, the court itself and Justice Minzner somewhere in between. That's roughly the way it was over the course of the past five years. Interestingly, however, a closer examination of the five years reveals some changes within them. The direction of the court and the voting of some justices seem to have changed somewhat in the latter part of the five year period. We'll take a look at that in a forthcoming post.